I got to Luisa Miller a second time, in a cheap seat ($44). Second half I moved to an empty house seat next to someone who sang in the first ever season of the AETT Opera (precursor to Opera Australia). In retrospect the orchestral sound was much better in the cheap seat. The drama of the last acts was probably the better for a front-on view. The work as a whole continues to bemuse. Admittedly, the libretto is probably a botched job and the adaptation of Schiller a butchering, but the disavowal in this production of the Tyrolean element has robbed it of a picturesque foil to the melodrama which we plunge into from the finale of the first act onwards. It is not as if the Tyrolean element was merely trivial – it infuses the yodelling wind writing (it is not only the clarinettist at Naples who must have been quite impressive) as well as the more obvious hunting call-and-answer chorus. Without it, the drama when it comes seems more abruptly contrived than I think it would otherwise. At least I got the “flashback” element this time: at the start Luisa is laid out as in a (rather Ophelian) bier. My neighbour had never seen Luisa Miller before. I doubt if I ever will, on stage at least. Perhaps it is a work best savoured for its prefigurings – lots of ur- Traviata and Rigoletto, in particular. Still I’m very glad I’m saw it and can use my memories of seeing it when (as I certainly shall) I listen to it or watch it on screen in the future. Daniel Sumegi’s leering at the distraught Luisa again evoked momentary hilarity, though this time Mr Licata forbore to glare. The singing was again impressive. For my money the star turns were Dalibor Jenis as Miller and Diego Torres as Rodolfo, with a particularly fine rendition by DT of the one really famous aria from this opera. Sometimes Diego gets a bit of a rasp in his voice but it had settled down compared to my first attendance. One peculiarity of the opera is an unaccompanied quartet at the end of Act II scene ii (eg here at 1 hour 26 minutes in). It is really more of a solo for Luisa with an oddly-voiced accompanying trio of the (contralto) duchess -Rodolfo’s betrothed – and the two bass baddies, Walter and Wurm. At the end, the orchestra comes in to bring the curtain down, which is a kind of test: have they stayed in tune? They did both times, but I found it almost impossible to feel or follow the harmony whilst they were on their way there. It’s something about how singers with big produced voices sing together which is a mystery to me. On Saturday-night-before-last (by now) to Opera Australia for Luisa Miller, one of that increasing rarity on OA’s roster, an actual operatic rarity. I’ve seen Luisa Miller described as one of an (albeit) limited genre of “Alpine Virgin Operas” – Bellini’s La Sonnambula is the most well-known example; another is Donizetti’s Linda of Chamounix. In each case, the alpine setting is a pastoral foil against which threats to the purity of the maiden in question are set. In La S and Linda, there is a happy ending; for Luisa (sorry about the spoiler) there isn’t. There wasn’t too much or even any of the Alpine pastoral in this production. Perhaps OA’s co-producers, in Lausanne, already have enough of it. The set was a severe black and glossy artefact with a kind of white garden-furniture still life of a bourgeois household at tea facing a fireplace from above which a bust of Verdi gazed down and behind which a mysterious figure skulked. At the beginning of the action this tilted up and hung upside down poised above the central stage section. Naturally, it returned to place at the end of the action. Nobody seems to know what this means or is intended to mean, from which I infer that parting with $20 for the program would have left me none the wiser. Is it, as one person speculated online (sorry, can’t be bothered to refind the link) a depiction of the act of usurpation by the Count? The best guess I could make was that it depicted the happy future for Luisa for which her father hoped which was snatched away from her as a result of her becoming involved with her betters. Alternately, it could be the “intimate life” to which it is usually thought that Luisa Miller marks a change in Verdi’s subject matter (as opposed to the more heroic operas of his “early” phase) though that strikes me as a bit too obscure. I realise I have got ahead of myself. The plot, shortly stated is: LM, beloved daughter of her retired soldier father (Miller, obviously), has fallen in love with a handsome stranger, Rodolfo. (Having seen A Winter’s Tale just the other week I was well prepared for this trope.) He turns out to be the son of Count Walter who has an eye on a widowed duchess as a suitable match for his son. The count’s offsider, Wurm (obviously a baddie) has his eye on LM. The Count’s first intrusion on the pastoral scene is driven off by Rodolfo’s threat to reveal how the Count (henceforth CW) succeeded his cousin to the title. As we subsequently learn, CW and Wurm did CW’s cousin in when it looked like the cousin was about to marry and beget heirs who would block CW’s succession. Rodolfo’s tactic only works for the first-act closer. CW has Miller thrown in prison. Wurm tells Luisa that her father will only get out if she writes a letter declaring her love for Wurm and swears to say that she wrote this letter of her own accord. She does so (for her father’s sake.) Rodolfo, in despair, accedes to his father’s wishes and marries the duchess. LM wants to die but her father dissuades her from this: they will wander the world to get away from it all. Luisa then catches up with Rodolfo, now married, who, also in despair, poisons her (without asking her) and then himself – ie, your typical murder-suicide. LM is apparently OK with this though she tells him the truth about the letter and there is a long farewell between them both and Miller. The chorus and the villains turn up for the curtain call and Rodolfo is supposed to kill Wurm although I’m not sure he succeeded on this occasion. The chorus spent the opera pacing around in a kind of funeral procession with top hats and flowers – apparently this (along with the pivoting still life) framed the whole thing as a kind of flash-back: the funeral at the end is pre-ordained. It’s been presented here as a bit of a star turn for young Nicole Car – billed elsewhere as possibly the next Joan Sutherland. Ahem. I suppose many things are possible. She was good though on the night I was there there were a few shockers at the top in her first big sing and some unrefined trills in the last act. The soloists as a whole were a strong bunch. Maybe that was why the orchestra seemed so loud – on the basis that they could surmount it. I got the feeling that Verdi was throwing the orchestral kitchen sink at things, both as to volume and complexity, though Aida-like, he thinned things out for the more poignant moments. I’ve left it too late to do a laundry-list of the cast. I enjoyed it. If I didn’t have other things on my mind I’d try to get to see it again. Mr Licata, the conductor, however, didn’t see it like that – he turned to the audience and gave a most spectacular and prolonged glare at the presumed source of the laughter – even whilst LM’s plaint continued. I think he was wrong: people were not laughing at the opera, but with it. If that is what Licata is like with the audience, I hate to think what looks he might be giving the orchestra. 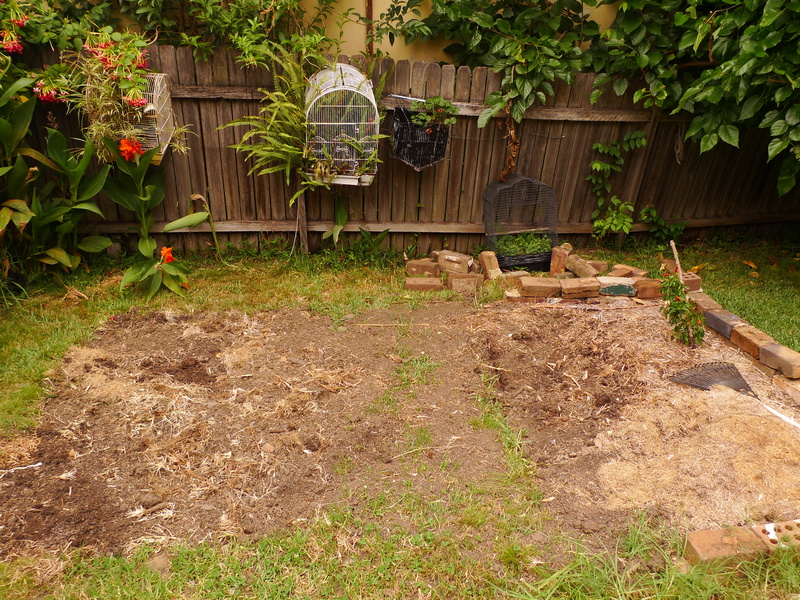 Two or three springs ago, whilst D was away in China, I put down a no-dig garden in the back yard of our (rented) house. My dream was to grow tomatoes. That’s it on the right of the picture above. We had one reasonable crop though in the end disease emerged. A bigger problem was the location. 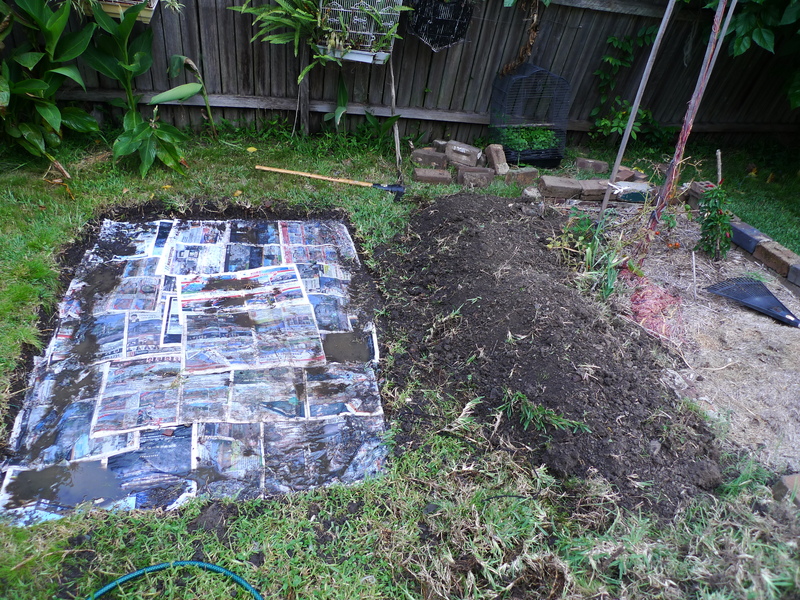 When we moved in, the remains of a previous garden bed were detectible. I thought I would keep that former bed and gain another. But there was a reason for the location of the original bed as compared to the spot I chose: namely that a mulberry tree (out of shot, to the right) cast shade in the afternoon. On his return from China and since, D has from time to time reproached me for my folly. Recently, he has been proposing shifting the garden bed (it has quite a lot of improved soil entirely disproportionate in expense to the monetary value of any crop we have harvested) to the sunnier situation. Pictured above is the point D had got to on Tuesday when I came home and told him to stop. I had just retrieved from the letter-box an envelope with the insignia of our landlord’s real-estate agent. At their most benign, such envelopes bring bills for water usage or notice of an impending inspection. Tuesday’s envelope contained a 90-day notice to quit. Or, as we say in the west, Gong Chow Yun Fat! Martin Place and indeed the whole city is decked out with Chinoiserie. It’s the first day of the year of the monkey. Westpac has come through with the moolah. This morning I took the train to work. As I tapped off with my Opal card, the reader informed me that I had $8.88 left. Is that auspicious, or what? On Saturday night to the opera for the second time this year, to The Barber of Seville. Something funny happened with a clarinet entry in Figaro’s first big aria. Just saying – to show I was paying attention. Indeed there was a noticeable scarcity of regulars at both Barber and Pearlfishers the week before. For Barber this was understandable – it is the umpteenth revival of a venerable production, but Pearlfishers is a new production and it is unlikely that many regulars/oldies were seduced by the medley of arias making up the Opera in the Domain which was also on that night. The foyer was jazzed up with various bright lights and social media razamatazz. Twin fake palm trees provide a backdrop in front of which you are invited to broadcast your attendance at “Opera Sydney-style.” I suppose this is Lyndon Terracini’s pursuit of the “big night out” crowd. In the meantime, it looks as though his hated opera snobs are staying or drifting away. I don’t think it can just be put down to their dying off. You are currently browsing the Stumbling on melons blog archives for February, 2016.